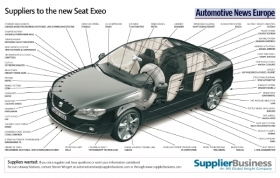 The Seat Exeo has a numerous components to minimize stress experienced by occupants during a collision. The mid-sized car's entry-level model offers six airbags as standard equipment. Takata Corp. subsidiary Takata-Petri delivers the passenger airbag, side airbag, head-side airbag and knee airbag. Grammer AG of Germany further prevents occupant injury by supplying the standard-fit active head-restrains that are designed to minimize whiplash in the event of a crash. Grammer also contributes seat cushions and backrests, while Autoliv Inc. of Sweden provides the vehicle's electric seat belt pretensioners. The Exeo is Seat's entry into the mid-sized segment. The sedan and station wagon, which is called the Exeo ST, are based on the previous-generation A4 from sister brand Audi. However, it is not just a re-badging of its Volkswagen AG sibling. About a third of the Exeo's parts are different from the A4's. The vehicle comes in four trim levels -- S, SE, Sport and SE Lux -- and with three engine options - two diesels and one gasoline. The diesel powerplants have advanced common-rail technology. Seat assembles the Exeo at its factory in Martorell, Spain. Prices start at 21,990 euros (about $29,670) in the German market.